I read this article and found it very interesting, thought it might be something for you. The article is called About Us and is located at https://perrysaquaticscentrelincoln.com/us/. Perry’s Aquatics Center is Lincolnshire’s premier store for tropical and cold water fish as well as clean Marine products and accessories. We have everything that you need to build your own custom aquarium to your specifications. 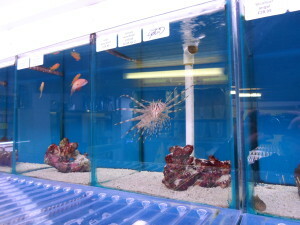 We have a wide array of high-quality corrals, plants, plankton, tanks, lighting, filters, feeds and various accessories. Feel free to stop by our store to get some ideas and to speak with some of our experts and don’t forget to ask about our free water test service. Our knowledgeable fish keepers will be able to test your water to find any impurities are issues that could cause health problems with any of your fish. By identifying these issues early we can help to save you money and ensure the health and well-being of every fish in your tank. Perry’s began in 1991 as a hobby store with just one custom fish tank and a few tropical fish. The original owner Wayne Perry still continues to work at Perry’s Aquatics Center, running the family business. The business began when Wayne began to breed angelfish. Perry’s Angels fish farm was at one time producing up to 15,000 baby angelfish each and every week in over 300 different fish tanks. The largest operation in Europe at the time. Starting with this success, Perry expanded and began selling his own individual breed of angelfish as well as other tropical fish. Each and every year Perry’s Aquatics Center is committed to getting better with a focus on industry-leading customer care, satisfaction and maintenance. We are committed to delivering a high-quality environment for our customers to enjoy as much as we do. We always keep our tanks clean and well stocked with some of the most exotic marine fish and coral available in the business. As always, we encourage visitors to come in and learn more about these amazing animals. Perry’s Aquatics Center not only caters to tropical fish enthusiasts and aquarium owners, but we also encourage fish enthusiasts of all types to come in and see our store. We are regularly getting all kinds of new and exotic species into our store so it’s important to check back often. No matter the amount of space that you have in your home is possible to keep fish and we can give you tips on how to care for both cold water fish and tropical fish. Feel free to stop in and visit us with any questions that you may have, or simply to take a look.